Since becoming parents we’ve found date nights particularly challenging, something I’m sure anyone who has had kids will understand. Over the past few weeks, we’ve been making regular weekend trips to Belfast as we get to the business end of our self-build and confirming elements like our kitchen and other interiors. Yesterday we decided to turn our trip into a ‘date day’, so after hitting some home and interiors shops we made our way to Bull & Ram Belfast. 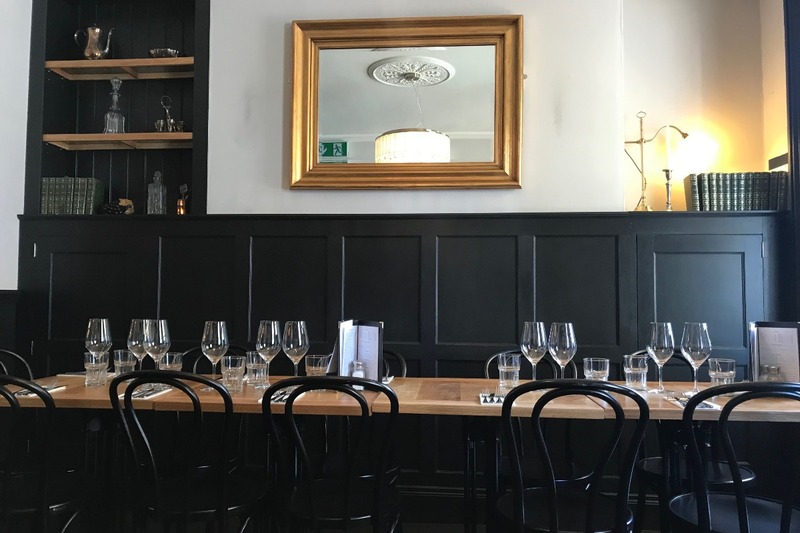 This is the sister restaurant of Bull & Ram in Ballynahinch, which we have dined in on several occasions (check out our Bull & Ram, Ballynahinch review here), so we were looking forward to our first visit to the Belfast establishment. We had booked our table for 1 pm, and as we arrived the restaurant was quiet, which for us was nice as it meant we could get in and grab a few photos (that’s bloggers for you), and just sit down and have some us time. We took our seats and checked out the menu, which included a 4-10-4 lunchtime menu (£4 for a starter, £10 for a main and £4 for a dessert). We were served throughout our meal by the very friendly Victoria, who took time to tell us a bit about the building and take us through the menus. 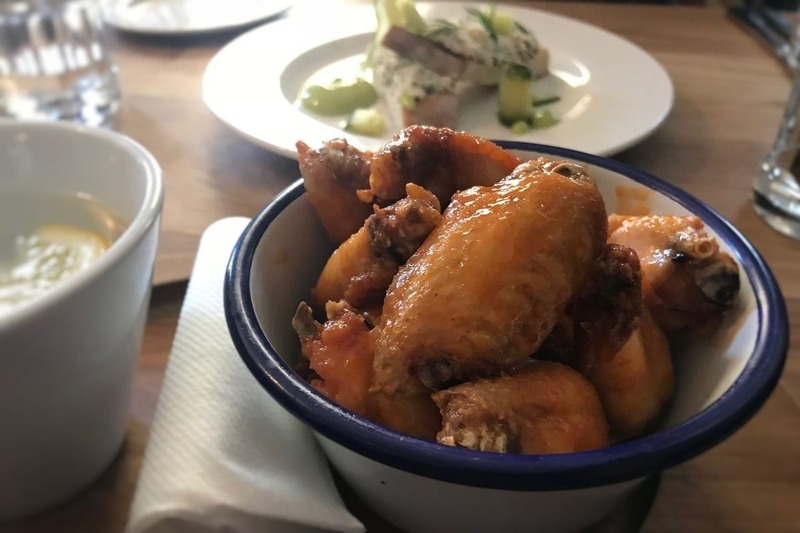 With such a great choice of dishes to pick from across both menus, we decided to go for a few dishes from the main menu and the 4-10-4 menu – and it proved to be a good call. 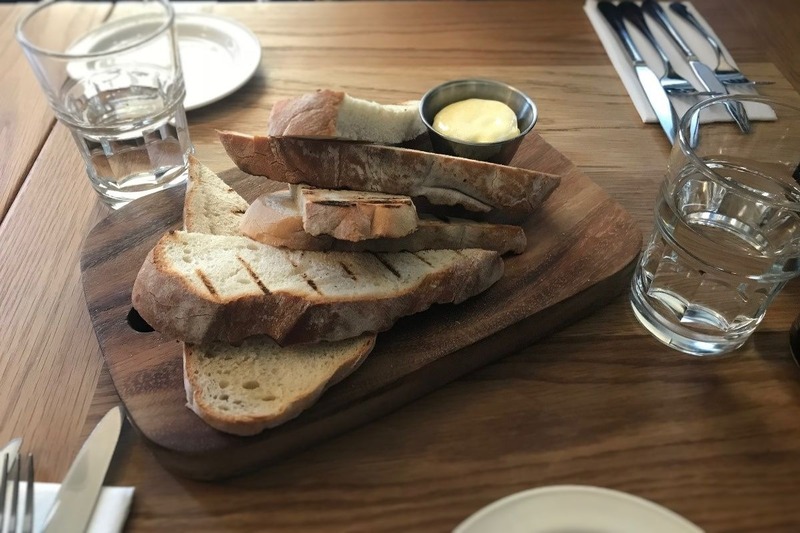 For starters, we opted to share a plate of bread with Abernethy Butter, followed by a portion of hot & spicy chicken wings and crab on toast with pickled cucumber and a dill emulsion. Both these dishes came from the 4-10-4 menu, and as far as value is concerned, for £4 a dish, you simply couldn’t go wrong. The bowl of wings had just enough heat to leave you wanting more – and with about 20 wings in the bowl, there was plenty to keep going back for. 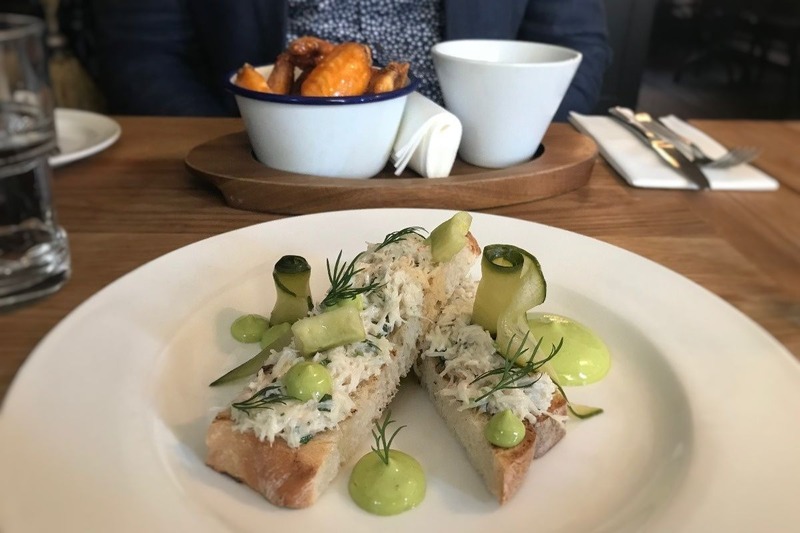 The crab starter was flavour packed and beautifully refreshing on the palate, while creamy and smooth, making this an extremely enjoyable dish to start. The amount of crab meat on offer was certainly generous, and this left us eagerly waiting for the main course. If the starter course was anything to go by, we knew we were in for an enjoyable lunch. Having enjoyed the sublime steak dishes on offer in Bull & Ram’s Ballynahinch restaurant, we decided to opt for something different for the main course in the Belfast restaurant. Having recently talked about the stunning Hadski burger possibly being Belfast’s best burger, we wanted to see what Bull & Ram had to offer in this department, while the confit duck leg immediately jumped out at us from the 4-10-4 menu. The Big Bull Burger was made from 3 meat cuts from Hannan’s Meats (the best in the country in our opinion) and served with cheese and a tasty smoked chilli and tomato chutney. The dish was accompanied by a superb portion of beef dripping chips, with the whole thing coming together to give you a Big Bull Burger hug! 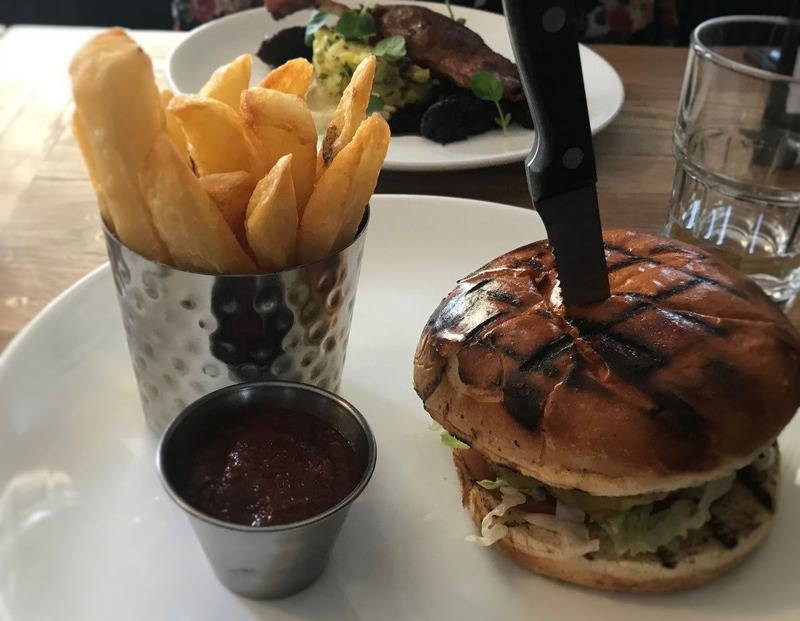 As far as our hunt to establish Belfast’s best burger, Hadski’s just pips Bull & Ram, but the Big Bull Burger certainly hit the spot and we’d highly recommend it – you won’t be disappointed. 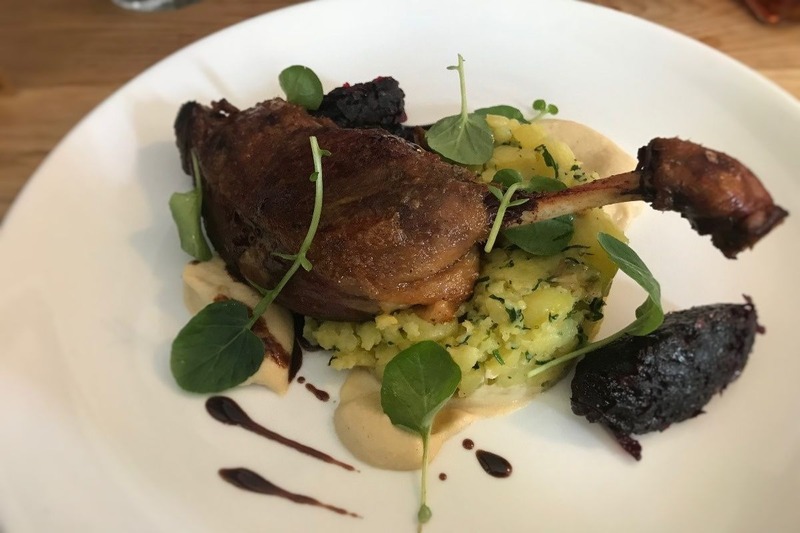 The confit duck leg was served with a creamy celeriac puree, herb crushed potatoes, and beetroot chutney. The rich duck meat was unbelievably tender and simply fell off the bone, while the skin was so delightfully crispy that it mimicked pork crackling. This crunch. paired with the smooth celeriac and offset by the punchy chutney was a feast for the senses. A triumph of cooking in our eyes, and for only £10, again this represented incredible value for money, especially considering the ingredients and quality of cooking on offer. For dessert, again we opted for a dish from the 4-10-4 menu with a vanilla pannacotta which was served with Amarillo soaked cherries and honeycomb. The second dish we opted for was a chocolate brownie with marbled strawberries and vanilla ice-cream. The pannacotta was smooth and light, with the Amarillo cherries providing a wonderful flavour to the dish. 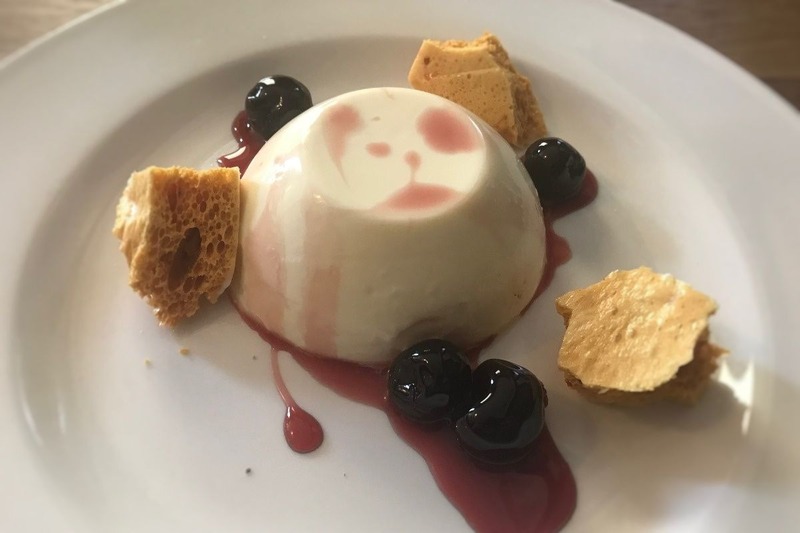 This was a great way to finish lunch, and we could easily have gone back for a second or third helping of pannacotta (we do love ourselves some pannacotta!). The chocolate brownie was served warm and had an almost fudge-like texture to it. With a crunchy base, the brownie provided a rich chocolate taste that would be a hit for chocolate lovers visiting Bull & Ram Belfast. 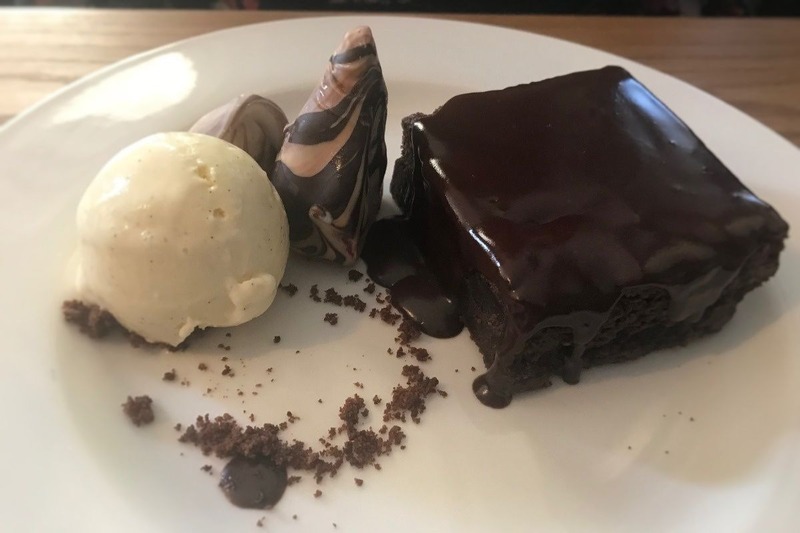 The ice-cream was needed as the brownie on its own would have been a lot of chocolate for us, but it was certainly another fab dish, and a great way to finish what had been a wonderful lunch at Bull & Ram. Have You Visited Bull & Ram Belfast? Have you dined at Bull & Ram’s new Belfast establishment yet? We’d love to know what you thought of it. Let us know by commenting below. We were certainly impressed and can’t wait to get back to sample the new spring summer menu. 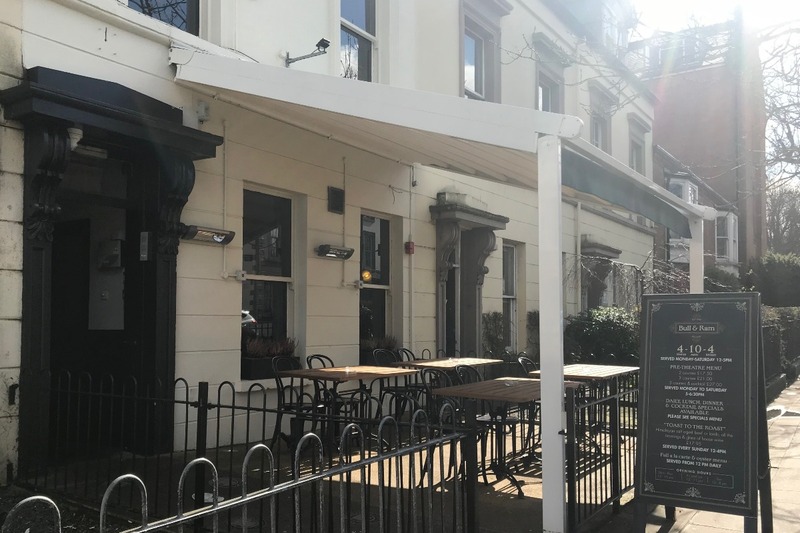 The 4-10-4 menu is a fantastic deal, and with the quality of food on offer, you’d be well pushed to find a higher quality dining experience in Belfast for this value. Throw in a drink, and for £20 you can enjoy a sublime 3-course meal in the heart of Belfast’s Queens Quarter! 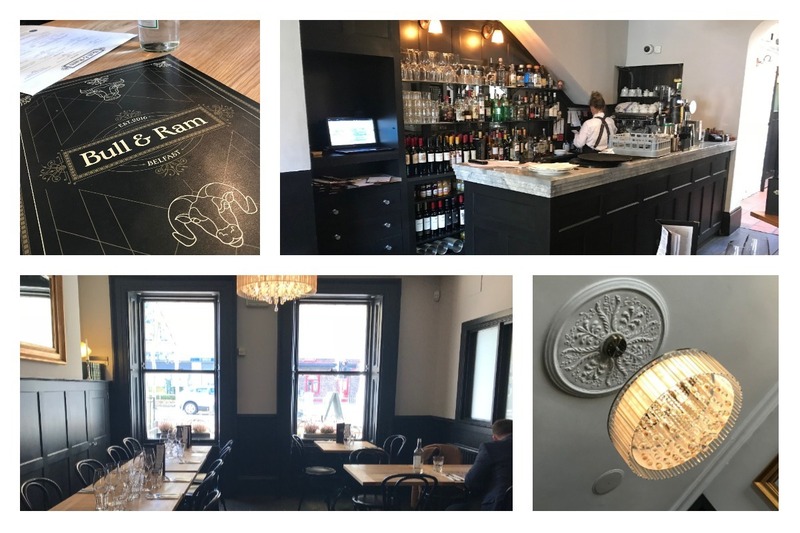 Bull & Ram Belfast has made the same impression on us as their sister restaurant in Ballynahinch, so if you’re looking for somewhere to eat in Belfast, and don’t fancy venturing into the heart of the city, be sure to check out Bull & Ram on University Road. For more information on Bull & Ram, and to check out their latest menu, visit bullandrambelfast.com. Until next time, thanks again for reading.